Close-Out Sale! Just size 3T is left. A dressy-casual 4 pc complete outfit original designed by DapperLads. This boy's festive outfit is made up of quality separates that can be re-worn the rest of the year. The outfit includes a 100% cotton chambray button down with a subtle tan stripe, a navy velvet-finish vest and 100% cotton blackwatch plaid pants in navy and hunter. A hunter green satin bow tie completes this look and is included with the outfit. The pants have pleats, belt loops and elastic in back. Straight leg. A touch of red accents the plaid. With the exception of the bow tie, all pieces are machine washable. 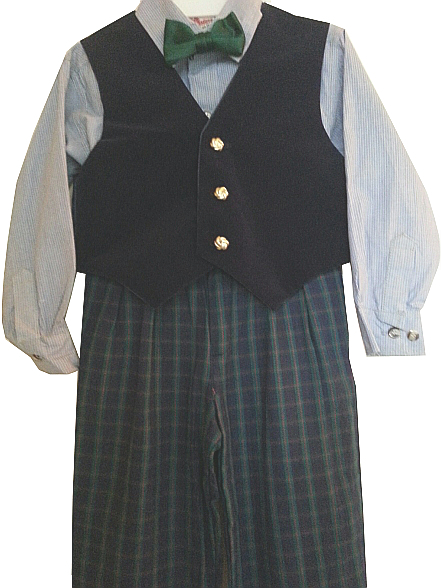 We do recommend hand or delicate washing for the vest.